According to the experienced tourists that have been to more islands than they can remember, the Central Lombok Regency doesn’t really get the credit it deserves. Most tourists shy away from it because the beaches and bays there are too far away from the capital and the airport. Plus, the fact that they are less popular than the waterfalls, Mount Rinjani, and the Senggigi Beach makes them follow the big crowds, leaving these gems behind. The Selong Belanak Beach, for example, is located in the West Praya sub-district (it’s famous for the breath-taking views) and is approximately 40 minutes away from Kuta, another famous tourist spot in Lombok. The biggest concern of any visitor is, of course, comfort. When we land in a foreign country, we’re a bit riddled by the unusual customs and traditions, not to mention the different lifestyles. Well, don’t you worry about that: even though this beach isn’t the most technologically advanced one on the island, you’ll still get a decent level of comfort there. The local business owners know the place better than anyone and are quick to react to the increased flow of tourists. The Selong Belanak Beach has more to offer to the average visitor than you could think. So, without further ado, let’s dig deeper and see exactly what it is good for. Now, people think that Bali is the best island in Indonesia, but in many regards, Lombok is the obvious leader, thanks to spots like this one. The biggest selling point of this island is that it’s diverse and versatile, meaning even the grumpiest tourists will find something they love. Every single beach is unique, even though they might look the same from afar (or on the screen of your device). The Selong Belanak Beach is, without a doubt, a place worth visiting. If you put prestige first and can’t stand garbage on every step of the way, then this spot will be right up your alley. The shore is shaped in quite a peculiar way: it’s curvy, and the hills on each side make it look fantastic. You might’ve already figured out that this beach is a part of the Selong Belanak Bay that’s considered to be the pride and joy of Lombok among the wealthy folks. Standing there, you’ll be able to face the majestic Indian Ocean. The coastline is 1-kilometer-long, offering you more than enough space to walk around and find a perfect spot for resting. There’s a village on the south side, and the locals are used to the constant flow of foreigners. They don’t necessarily speak English, but if you’re lucky, you will see one of the younger men/women that are always happy to communicate with the tourists. The Selong Belanak Beach is perfect for making new friends. In the village, you’ll find approximately 40 families. They are all fishermen – have been for many years, just like their ancestors. Note: if you’re a fan of swimming, please remember that the boats of the fishermen cover most of the “real estate” of the ocean near the beach. So, move to the center/north of the bay: there, you’ll be able to swim, and also dive. By the way, tourists are more than welcome to rent fishing boats and try their luck. Renting is cheap in Lombok, and the local fellas will be happy to show you a trick or two that they learned from their elders in the past. The Selong Belanak Beach comes with calm waves and white sand grains. For “moderate” water activities, that’s a perfect combination. With that said, the surfers probably won’t like the quiet waves. For them, this place will be something of a disappointment. Sunbathing and walking around the beach are actually the most popular activities in Lombok. Sometimes, just lying around on the beach and feeling the hot sun rays hitting your back can be more satisfying than conquering even the steepest waves. Be careful, though, and use sunblock so that your skin doesn’t get burned. The atmosphere on the beach is very friendly; both the foreigners and the locals treat each other with respect, and that deserves a big thumbs up. Many folks visit Lombok to see and learn more about the lives of the regular citizens. You’ll have a great opportunity to do that at the Selong Belanak Beach, dear readers. Find a nice spot under an umbrella and observe. You’ll see kids grabbing some water for their homes, men fixing their boats and fishing in the open sea, women making delicious meals from the fish their husbands catch, and more. Again, this way of life has been around for many centuries, and it’s not going to change in the nearest future. The people that are used to big cities, busy lifestyles, and the heavy use of modern-day gadgets will find the Selong Belanak Beach quite intriguing. I recommend leaving your gadgets in the hotel room and joining the locals in their simple yet honorable daily routine. There’s something humbling and revealing in trying to live like our ancestors. This place is popular, no doubt about that, but you’ll rarely if ever seen huge crowds there. If you’re a fan of big, noisy crowds, get to the beach during the holidays: that’s when it will be full of people. The rest of the time, it’s half-empty, creating just the right conditions for you to relax and have a good time in peace and quiet. Thankfully, that doesn’t mean there aren’t any public facilities in the area – not at all. You’ll find several warungs once you get closer to the village of the fishermen. These authentic buildings will be perfect for leaning back, having a delicious meal and resting your tired feet. There are numerous high-class hotels in the area: you won’t even have to go far from the beach, as they’re all located pretty close to the shore. The price range, as always, is pretty wide. The foreigners will be able to rent a decent room even if they’re on a super-tight budget. Unlike the other remote tourist spots in Lombok, the Selong Belanak Beach has some decent roads. And, on your way to the destination, you’ll go through mighty tobacco farms. Once you reach the parking lot, step out of the vehicle and walk for about 50 meters. Soon, you’ll reach the clean, quiet, beautiful beach. Note: don’t be shy to ask the locals for directions. The thing is – there are no signs telling you how to get to the beach. Riding a bike is awesome, but make sure not to drive through the sandy parts of the bay. Now, even though the sand might seem nice and cozy, don’t try to walk in sandals, because you’ll end up hurting your legs. The lovely Seger, Mawun, and Kuta beaches are located in the same area. 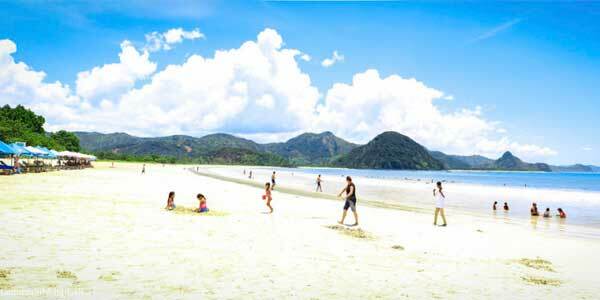 If you’re tired of the Selong Belanak Beach, try visiting those spots for a change of scenery. From Mataram, the capital of Lombok, you’ll have to drive for 1/1, 5 hours to get to this place. The road is almost 50 kilometers long. And if you landed at the International Airport, the road will be only 25-30 kilometers long and take less than an hour. The closer you get to the beach, the better the view will get. You’ll be walking on a steep road, and it will feel like the entire bay is at your feet. The crystal-clear ocean, along with the white sand, will create just the right atmosphere for you to dive in. The biggest selling points of the Selong Belanak Beach are the clean shores, the friendly locals, and the fact that you’ll be able to enjoy it in solitude. So, summing up, let me just say that this is one hell of a spot for a getaway trip. First of all, there are plenty of accommodations and cafes/restaurants in the area. Second, even though the infrastructure of the beach is advanced, which makes it a tourist magnet, you’ll still get to be alone with yourself even during the high season. As for the water activities (those include diving, snorkeling, and swimming), they’ll help you stay, well, active, and never get bored. The fishermen might look a bit scary at first, but they are all nice people; they even helped me with the 101 of fishing. As a tropical island, Lombok is great. As for the Selong Belanak Beach, it's one of the finest places to rest near the Indian Ocean. If you've never been to a beach, this one will take your breath away. Even if you're a pro, you'll still love what Selong Belanak has to offer. The road is even better these days. You'll still need to walk on foot, but compared to our last visit, the improvements are big! We were a bit worried about the prices on such an epic beach but were happy to learn that everything was more than affordable.